SparkShorts, Animated Films From Pixar, Foreground Women And People Of Color The animation studio has launched a series of short films intended to increase leadership opportunities for women and people of color — populations historically underrepresented in the field. 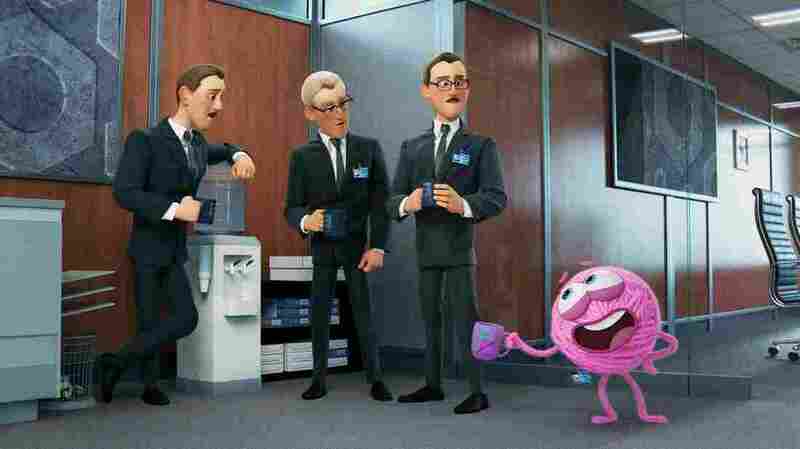 In Purl, a sentient ball of yarn finds itself out of place at the office. The short film is one of several created through a new Pixar program called SparkShorts. This year, Pixar has launched SparkShorts, a series of short animated films designed to give women and people of color more leadership opportunities in animation. The first three films were released in February on YouTube. SparkShorts addresses the major problems in bringing along new directors for feature-length animation: long lead time and big budgets. "As we thought of how to get opportunities to future filmmakers quickly, there was a lot of discussion about what we could be doing in a different way," said Lindsey Collins, Pixar's vice president of development. "And one of the things that came up was just how long it takes for one of our films to get made and therefore the runway for new filmmakers can be very long." Each SparkShort takes just six months to produce, compared with four to six years for animated feature films. The SparkShorts also have much smaller budgets. Pixar Animation Studios declined to comment on specific budget costs. The New York Times reports that Pixar animated feature films "generally cost roughly $175 million to produce." Collins said the idea for SparkShorts stemmed from the idea of art-school projects, where a film has to be produced on deadline with few resources: "We said: What if we chose some filmmakers ... and said they could make a film as long as it was animated and was a narrative, character-based story, that they would be left alone and be given the resources to get a film up?" A goal of the SparkShorts program is gender parity, so each set of SparkShorts will feature an equal number of male and female directors. In February's release, two of the three films were directed by women (with three more films coming later this year). Future groups of SparkShorts will be released on a year-by-year basis. One of the first stories, Purl, is directed and produced by two women, Kristen Lester and Gillian Libbert-Duncan. It tells the story of a living pink ball of yarn named Purl, who is clearly out of place among her human, white, male colleagues. The short film echoes what it's like to be a woman working in a predominantly male office. "So what's particularly nice about Purl's reaction online is that people aren't clearly pointing out, like, 'Oh gosh, it doesn't feel like it's at the animation caliber of a theatrical short,' but are rather kind of smitten with the story," Collins said. "And it's ultimately reassuring our philosophy here that if the story is great, the rest of the audience will be right there with it." Collins said audiences are focusing more on the story's narrative than with the quality of the animation of the SparkShorts films. "So there's not this sense of not, like, 'Oh my gosh, I have to go out in front of Incredibles 2' and I'm bearing this huge burden of: 'This has to be the most amazing short film ever,'" Collins said. The first three SparkShorts to be released — Purl, Kitbull and Smash and Grab — are available to watch on YouTube. The next three films will be released on Disney+, the company's just-announced consumer streaming service, in the fall. Two of the fall releases will be directed by people of color. Edwin Chang, a Korean-American, will direct Wind, a magical realism story about a grandmother and grandson. And in Pixar's first animated short with Pinoy characters, Filipino-American Robert Rubio will direct Float, a story about a father's instinct to protect his son — who has the ability to float in the air. Erica Milsom, the last of the three women directors of this year's SparkShorts, will release Loop, which tells the story of a non-verbal autistic girl. Collins said Pixar is trying to make two to four new SparkShorts per year, with the exception of the initial 2019 batch of six. "The hope is that if we keep going with these, that people will continue to get more opportunities," Collins said. The president of the non-profit organization Women in Animation, Marge Dean, has noticed that slowly, women are getting more opportunities. "So five years ago, I would say the animation industry was pretty much a boys' club," Dean said. Those opportunities really increased beginning in 2017. That's when the #MeToo movement took off after producer Harvey Weinstein, former Nickelodeon animator and The Loud House creator Chris Savino, and Pixar's former chief creative officer John Lasseter — among others — were accused of sexual misconduct. Dean said the animation industry landscape has evolved since the arrival of #MeToo. "That changed everything," she said. "That's when everyone woke up and goes, 'No, we're serious about this.'" There's still a long way to go before women achieve equal representation. According to Women in Animation, 60 percent of all animation and art-school students are women, yet only 20 percent of creative jobs in the industry — producers, directors, writers, animators, and art and design jobs — are currently held by women. Women in Animation is aiming for parity by 2025. "I think that the next step is getting women to get to the top," said Maureen Fan, who is an Asian-American woman and CEO of Baobab Studios. "There's the grassroots bottom-up. But there's also top-down. Right, so, people tend to hire people like themselves. So if you end up having more diversity at the top, it will naturally also be bringing in more diverse perspectives." Fan is pushing for more women and people of color in animation. The Baobab Studios animated short Crow: The Legend is based on a Native American legend. Fan says she purposely cast the film largely with people of color, including John Legend, Oprah Winfrey and Constance Wu. Fan is also active in Gold House, a group of Asian American executives, founders, and A-list celebrities in Hollywood, Silicon Valley, New York City and elsewhere who "help each other move up the corporate and cultural ladder." Among their efforts is #GoldOpen, "a system to drive Asian films to no.1 at the box office opening weekend through buyouts, theatrical and social network partnerships and viral social media campaigns. The Asian community movement bought out theaters to boost the box office numbers in summer 2018 for the release of Crazy Rich Asians, Searching, Burning and more," Fan wrote in an email to NPR. In December 2018, Fan created a sub-group within Gold House to discuss how to create representation in animation: "whether it's representing diverse viewpoints, meaning animation about different types of people and cultures, and also getting more diverse viewpoints behind the camera as well," she said. The group is also actively working to measure the profits of diversity on the big screen. "When you have more diversity points or you make films about different cultures and races, it makes good money in the box offices," Fan said. In 2017, Coco became the sixth highest-grossing Pixar animated feature film with a global box-office intake of $807.1 million. The film takes place in Mexico during Día de los Muertos — or Day of the Dead — and tells the story of a young Mexican boy who embarks on a journey to discover his family's history and, in the process, uses music to bring the memory of the dead back to life. "And while I would like to be idealistic and say we're doing the right thing, I do think it always does come down to business," Fan said. "And we do have to prove the financial worth of doing so." Ted Robbins edited this story.